Jacqueline got the idea to create a shoe that has a collapsible toe area so you can walk to the salon in style and then put your foot over the toe section to let your pedicure dry while you walk out of the salon and keep your day moving along. In fact, she had the idea years prior and created a version that wasn’t quite right. But last year, the idea percolated to the top of her mind again. This time she wanted to make it happen. Through referrals, she landed on a firm that put her in touch with the right people to help her create a prototype and find a manufacturer. “It took about six months and many reiterations before we got it just right. The strap had to be at the perfect angle, the design had to function, the toe box had to be the right dimensions, the materials had to be top drawer and it had to look good too.” Jacqueline was finally happy with the finished product and placed her order hoping to receive the shoes in time for the Holiday boutiques. “I didn’t factor in the time it takes to get things delivered, so I had to air express part of my order.” While she waited for it to come in, the got her design patented and her name trademarked. 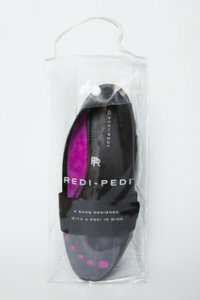 The name Redi-Pedi came from the idea that your pedi is ready to walk when you’re wearing these shoes. 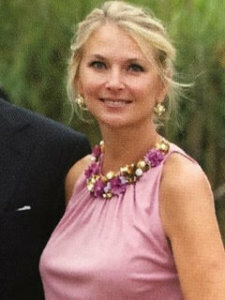 Jacqueline reached out to her resources to find someone to help with a logo and packaging. 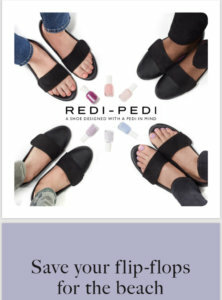 The Redi-Pedi is perfect for the working woman who wants to get a pedicure at lunch or on her way home, the yoga mom running by after class, or any busy woman who is always on the move. The premier style is currently available in black water-resistant faux leather with a matching suede strap, plush magenta lining, and a comfortable padded insole for all day wear.